Taj Online LLC ( DBA Meena Jewelers) in Atlanta, GA is one of the USA's largest, most desirable and fastest growing jewelry brand in USA. Started in 2009 in Atlanta. Following in the footsteps of the family business of the past 50 years. It is a story of a successful USA enterprise, which has delivered value to its customers and in a complex category, marked by its completely localized front end as well as back end. Meena Jewelers in Atlanta, GA USA has set up production and sourcing bases with through research of the jewelry crafts of India and the Middle East. While jewelry at Meena Jewelers in Atlanta, GA USA is crafted in one of the world's most modern factories it still uses the same craftsmen and jewelers that are traditionally called sunaar or soni back in India who are traditionally the craftsmen of unique ethnic jewelry that symbolizes the jewelry art and craft in India. 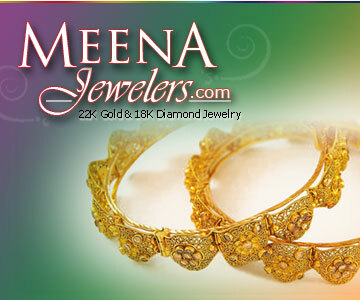 Every product at Meena Jewelers in Atlanta, GA USA is painstakingly crafted to perfection. Diligent care and quality processes ensure that the Meena Jewelers in Atlanta, GA USA finish is unmatched by any other jeweler in the country. Meena Jewelers in Atlanta, GA USA challenged the age-old jeweller's word with an unmatched guaranteed purity warranty. All gold jewelery sold is guaranteed 22kt gold with mark of purity on every piece of jewelry. We also sell contemporary 18kt designer diamond and white gold jewelery which is marked for its purity of 18kt. The jewelry industry in the USA until now was completely governed by individual trust. Meena Jewelers in Atlanta, GA USA introduced innovations like XRF X ray light technology, the only non destructive means to check the purity of gold. Meena Jewelers in Atlanta, GA USA also introduced professional retailing in the USA 22kt jewelry bazaar, with our online jewelery store and a fabulous retail outlet in Decatur, GA where women can shop in our spacious comfort and peace without haste and hurry and without worrying about the purity of the jewelry they are buying, as well as, select from the best jewelry collections available in the USA market. Meena Jewelers in Atlanta, GA USA today is USA's most aspirational fine jewelry brand with plans to spread to different cities in the USA. With an exquisite range of 18kt gold jewelry studded with diamonds or colored gems and a wide range of equally spectacular jewelry in 22Kt pure gold. Jewelery is one of the last great commodity frontiers in USA; it has remained so because this market is very fragmented, very unorganized. Meena Jewelers in Atlanta, GA USA has successfully taken on the challenge of transforming this frontier into a reliable consumer space by bringing to it all the virtues and benefits that branding offers". The CEO of Meena Jewelers being a trained computer Professional has tried to transform this age old and timeless business occupation by integrating technology with the old traditional culture of Indian Jewelry to bring you one of the finest jewelry store with innovative technologies and search and browsing tools that are unique in finding the right products online at www.meenajewelers.com We have the latest designs in 22kt gold Bangles, 22kt gold Rings, 22kt Indian Necklaces, 22kt Indian Gold Earrings, 18Kt Gold Diamond Jewelry in Indian Designs, 22Kt Ruby, Emerald, Sapphire and other Precious and semi-Precious Stone Jewelry and a huge selection to choose from. So be assured that all your requirements will be fulfilled at one stop. Located in the heart of the Indian area of Decatur, in the Greater Atlanta area, it is easily accessible from major highways I 85, I 285 or US 78. Customer service hours and/or Store Hours:Tue-Sun : 11:00 AM. -7:00 PM.